For most people, the main reason for smoking cannabis is to experience the psychoactive high. Yet, smoking strains loaded with tasty terpenes is an added bonus, and they make great additions to edibles, concentrates, or a regular old roll-up. Cannabis is a unique plant species indeed. As well as providing a pleasurable and often euphoric high, the plant is crammed full of a rich variety of interesting molecules. One such family of chemicals are known as terpenes—volatile aromatic hydrocarbons that feature distinct scents and flavours. These chemicals are responsible for the easily recognisable yet diverse smells and tastes of cannabis flowers. Just as growers selectively breed cannabis to produce different psychoactive effects and growing traits, the same is done to bring out the aromas of different strains. Cannabis breeders have harnessed the power of terpenes to infuse certain strains with distinct and sensational flavours. There are strains that emanate aromas of chocolate and candy, strains offering hints of tropical fruits and citrus, and strains reminiscent of fresh forest air. The spectrum is truly vast. Flavour adds something special to the smoking experience, and it also allows cannabis chefs the chance to get creative with their medicated recipes in the kitchen. Here are the top 10 tastiest Zambeza cannabis strains. Blue Spider is a sativa-dominant variety that stems from legendary parent strains White Widow and Blueberry. The trichomes on her flowers house a diverse range of aromatic terpenes that produce mouth-watering tastes of tropical citrus, berries, and pine. This diverse palette of flavour lights up the taste buds with each inhalation, making her a moreish strain. These flavours are very apparent when smoking blunts and bong bowls, however, they are even more pronounced when using a vaporizer. It’s her parent strain Blueberry that brings most of the taste into the mix here—a strain known far and wide for her immensely fruity flavour profile. White Widow should not be overlooked in this coupling, as she brings psychoactive potency into the mix, which complements such sensory pleasures. Blue Spider produces THC levels of 18%, contributing toward an uplifting, happy, and cerebral high that boosts productivity during daytime hours. Blue Spider features a medium growing difficulty and provides moderate yields. She’s also fairly squat, reaching only 110cm in height. After 8 weeks of flowering indoors, she will produce yields of between 350–450g/m². In comparison, outdoor plants put out yields of up to 550g/plant, grow to towering heights of 230cm, and will be ready to harvest during October. Rocket Banana possesses a name that describes both of her key characteristics. She features the flavours of a ripe banana, and sends the mind into outer space. This interesting strain was conceived out of a breeding project involving Banana and OG Kush. The result must have shocked the breeders when they tried this strain due to its mammoth THC levels of 25% or more. Such potency is enough to seriously inundate even veteran cannabis smokers. Novice smokers should approach this beast with the utmost caution, taking things one toke at a time. Her indica-dominant genetic profile ensures that the experience is characterised by deeply stoning effects that glue the body to the couch and cast a heavy yet comforting net of relaxation. After taking a few hefty hits, it won’t be long until the munchies kick in with full force. Strong scents and tastes of ripe and sugary bananas make every toke rich with flavour, making the craving for food even more powerful. Rocket Banana displays small and compact flowers, but don’t let their innocent appearance fool you. She bodes well in both indoor and outdoor environments, providing moderate yields in both settings. If growing indoors, expect heights around 140cm and yields of between 350–400g/m² after a flowering time of 7–8 weeks. Outdoor plants will peak at heights of 200cm and produce yields between 450–500g/plant once harvest rolls around in September. Blue Brilliant is a sativa-dominant lady endowed with supremely tasty genetics. She was destined to be loaded with flavour from the get-go: parent strains Blueberry and Super Silver Haze speak for themselves. Her flowers are dominated by tastes of berries, lemon, and fruit. This trait makes her a must in the kitchen of any serious cannabis chef. Making cannabutter from her flowers is a great idea when looking to add fruity notes to edibles such as brownies, cakes, and other desserts. These edibles won’t just taste incredible, but they will be well-armed with THC levels of 20%. This results in a powerful sativa high that is motivating and creative. The effects are relaxing and sociable—a true source of good times and giggle fits. Blue Brilliant maintains a moderate height both indoors and out, yet offers good returns when it comes to yield. Indoor plants will peak at heights of around 110cm, putting out good yields of up to 600g/m² after a flowering time of 9 weeks. Plants grown outdoors within the elements reach heights of approximately 160cm, producing yields of up to 650g/plant during the month of October. Pineapple Express will undoubtedly bring about nostalgic memories of a film that featured a mythical and potent cannabis strain. But let it be known, this strain does indeed exist. One of the most noticeable traits about this lady are her stunning flowers. Her buds feature tapered ends and a bulbous middle section, along with shades of light and dark green, and gorgeous, bright white trichomes. Looks aside, one of her most unique properties is her almost overwhelming flavour profile. Hints of sweetness, pineapple, and other tropical citrus descend from aromatic parent strains Pineapple and Lemon Kush. These parents also passed down potency in the form of a 19% THC value. Being indica-dominant, Pineapple Express induces a high that soothes the body, weighs down the eyelids, and catalyses a meditative state. Pineapple express is a productive strain, and a good choice when seeking to build up a solid personal stash of flowers. Indoor plants grow to heights of between 100–130cm, and can therefore be grown in small and covert spaces when utilising low stress training and pruning methods. Indoor plants yield up to 500–550g/m² after a flowering time of 55 days. Plants grown outdoors reach taller heights of up to 170cm, producing up to 550g/plant once her branches are ready for snipping and drying at the end of September. If the taste of candy and smoking weed are close to your heart, then Candy Caramelo is the cannabis variety for you. This sugary and sticky lady hits the sweet taste buds located on the tip of the tongue with essences of caramel, candy, and a hint of coffee. This strain goes hand-in-hand with a sweet dessert or a cup of espresso. Candy Caramelo was born out of the crossbreeding of parent strains Maple Leaf Indica, White Rhino, and Blueblack. These marvelous flavours are augmented by an indica high that relaxes the muscles and sparks creative flows. She’s a perfect smoke for the late-evening hours to dig into a good book or engage in creative projects such as writing. A THC content of 16% makes for a mellow high that is easily manageable and far from overwhelming. Candy Caramelo is an easy strain to grow indoors, only reaching heights of between 60–90cm. If discretion is a priority, this plant makes a good candidate. Indoor plants produce between 450–500g/m² after a flowering time of 45 days—a great outcome for a rather short strain. Outdoor plants behave much differently, growing to taller heights of between 170–240cm and producing harvests of 500–600g/plant. Super Silver Haze can be summed up in two words: peaches and cream. Her small and compact flowers are infused with these delightful tastes, leaving smokers coming back for hit after hit. But be careful not to overdo it! Be sure to stock up on snacks before engaging in a smoke session with this strain, as these flavours are bound to work up an appetite. These immense flavours were made possible by crossbreeding a legendary lineup of parent strains; namely, Skunk, Northern Lights, and Haze. In regards to the high, Super Silver Haze offers a surging, motivating feeling. Using this strain to start the day with a wake-and-bake will get you off on the right foot, ready to tackle the tasks of the day with determination and grit. The peak of this high can be harnessed to boost focus and attention span. Soon after, it tapers off into a relaxing sensation of mental clarity and physical relaxation. This award-winning strain grows pretty flowers that are densely covered in trichomes. 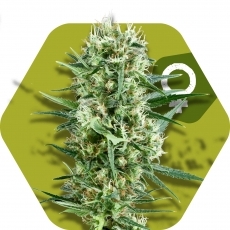 Indoors, she produces satisfying yields of approximately 550g/m², available after a flowering period of 8–10 weeks. Plants grown outdoors with more space to stretch can produce yields of around 550g/plant. There certainly is a theme here. Tasty strains have tasty names, and they are well-deserved for the most part. Crazy Cookies isn’t entirely sweet, but she offers contrasting flavours that complement and enhance each other. Connoisseur smokers can expect to detect strong notes of sweetness, earth, and spice. Along with her flavours, Crazy Cookies packs some serious heat in the domain of strength. Her powerful parent strains Cookies and OG Kush passed down a ferocious THC level clocking in at 24%. A single toke is enough to feel the sedating and stoning effects, and a whole joint will plunge you into a state of deep reflection. Crazy Cookies is a good strain for indoor growing when space is a limiting factor. Relatively small heights of 50–100cm are easy to conceal, and large yields of 500–650g/m² show that size does not always equate to output. When grown outdoors, Crazy Cookies is capable of churning out 700g/plant. Blueberry Cheese is a strain that should be included within the collections of every cannabis connoisseur, especially those enthusiasts who are fascinated with exotic tastes. These flowers offer sweet notes of blueberries combined with a rather unusual yet particularly pleasant taste of cheese. Entering a grow room or greenhouse full of these plants will overwhelm the senses, and make smoking her an absolute must. She’s an aesthetically pleasing strain that produces tall flowers with dark green shades, spikey sugar leaves, and fiery orange hairs. Blueberry Cheese is the product of parent strains Blueberry and White Cheese, and harbours a THC content of 18%. She generates an indica high that is ideally used late in the evening to eventually induce deep and restorative sleep. After a flowering period of around 60 days, indoor plants reach heights of 100–130cm and produce yields of up to 450g/m². Plants grown outdoors produce up to 500g/plant and reach heights of up to 200cm. Mixing strains Bubble Gum and OG Kush could only result in great success. That’s exactly how OG Bubble Gum was born. She boasts a truly narcotic high, with an indica influence that runs deep. She’s of great use to medicinal users looking for something to take the edge off pain, anxiety, and stress. A THC content of 19% leads to a hard-hitting high that acts fast and lingers for hours. Her fine flavours of sweetness, citrus, and berries make her a great addition to medicated edibles, a form of consumption that lengthens the high and results in far more potent effects. Her large flowers can also be used to make extracts such as oils and tinctures, providing further relief for certain conditions. OG Bubble Gum produces large yields regardless of the growing environment. Provided that she receives adequate lighting and nutrition, results will not disappoint. Indoor plants grow to heights of 130cm, whereas their outdoor counterparts surge to around 200cm. Choco Candy is not like the other girls; and that’s a good thing! Let’s start with her amazing looks. Choco Candy features chocolate brown shades on her flowers, along with flecks of dark green against a backdrop of bright white and orange hairs. Any trustworthy friends you invite to tour your grow space will definitely be impressed by her beauty. Laying eyes upon her is one thing, but experiencing her scent and taste is something else entirely. Lighting up a joint loaded with her flowers releases flavours of, you guessed it, chocolate, candy, and sugar. It’s no wonder that she tastes so good, considering she was bred using parent strains Chocolate Haze and OG Chocolate Thai. And with THC levels of 21%, she’s a psychoactive force to be reckoned with. Growers of Choco Candy will be pleased with the yield they receive of these sweet nuggets. Indoor plants produce between 400–450g/m², have a flowering time of 65 days, and grow to heights of 100–150cm. Plants grown outdoors reach up to 200cm and pump out yields of 400–500g/plant during early October.